First, they went through the gauntlet known as the Three Rivers League regular season. Then, they tested themselves in the Class 6A state playoffs. Finally, the best players from the Lake Oswego and Lakeridge volleyball teams were honored with nominations to the 2018 all-Three Rivers League team. 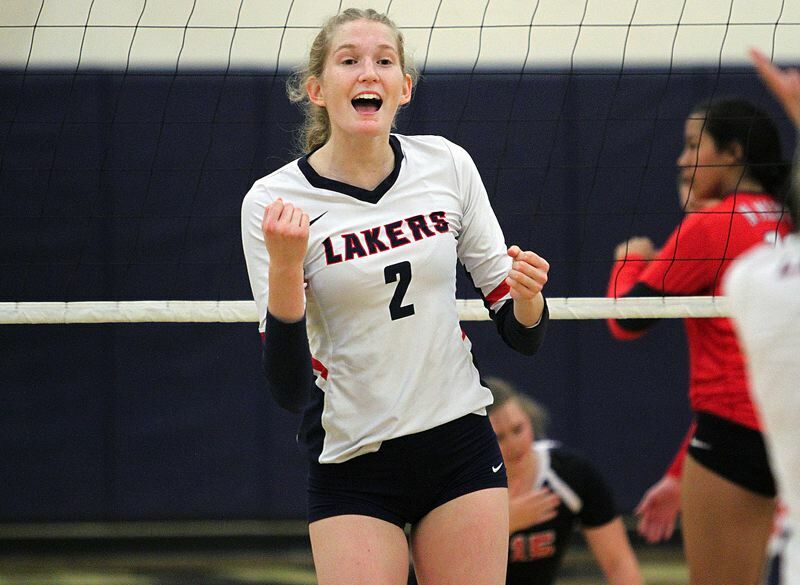 For Lake Oswego, the Lakers had six players honored, with junior outside hitter Jensen Kaelin and senior middle blocker Anna-Kate Treske winning berths on the first team. "It's no stretch to say that (Kaelin) did a little bit of, just about everything for us at a high level," said Lake Oswego coach Leejay Lee, noting that Kaelin led the Lakers in three of the more significant statistical categories and was in the top three in just about every statistical category. "In my opinion, she was one of the top three best all-around, most influential players in the Three Rivers League this year. "The most exciting thing about Jensen is that she still has so much room to grow and improve before she heads to college." Treske, meanwhile, made her presence felt in the middle of the net, leading the team in blocks and helping the Lakers play their way to second in the TRL regular season and within one win of a Class 6A state tournament berth. Also honored for Laker Oswego were junior outside hitter Jordan Noble (second team), senior right-side hitter Kylee Wimmer (honorable mention), sophomore setter Bridget Barnett (honorable mention) and sophomore libero Katie Dukart (honorable mention). "Anna-Kate was a huge force for us in the middle this year. (Her) ability to attack from multiple places on the floor put a lot of pressure on opposing team's blockers, opening up opportunities for all our other hitters," Lee said. "As a blocker, she was someone other hitters always had to be aware of. Anna-Kate was a big reason why we had the success we had this year on the court." For Lakeridge, five players were honored, that group led by junior libero Maicy Wear's selection to the all-TRL first team. "She earned her libero jersey through passing consistency, tenacity on defense, (being) a force in back row attack and serving accuracy," said Lakeridge coach Wendy Stammer. "Maicy ran the back row as a defensive leader for our team." Also honored for Lakeridge were sophomore outside hitter Kendall Baldwin (second team), senior setter Hannah Barry (honorable mention), senior outside hitter Sloan Culver (honorable mention) and junior setter Avery Ensing (honorable mention). Ellie Snook, sr., L, West Linn; Jackie Phillips, jr., S, Tualatin; Daley McClellan, so., OH, Canby; Ruby Kayser, jr., S, Canby; Audra Wilmes, so., OH, West Linn; Makayla Long, so., MB, West Linn; Jensen Kaelin, jr., OH, Lake Oswego; Anna-Kate Treske, sr., MB, Lake Oswego; Madison Hornback, jr., MB, Oregon City; Alison Brown, jr., OH, Oregon City; Maicy Wear, jr., DS, Lakeridge; Hadlee Hallman, sr., OH, St. Mary's. Alison Dreves, so., OH, Tigard; Erika Isaacson, sr., MB, West Linn; Hannah Hashbarger, sr., S, West Linn; Addison Crawford, sr., OH, Tualatin; Jordan Noble, jr., OH, Lake Oswego; Olivia Ashley, jr., RS, Tualatin; Kendall Baldwin, so., OH, Lakeridge; Caitlin Gay, so., L, Canby. Alicia Vandervoort-Walters, sr., OH, Tigard; Hannah Barry, sr., S, Lakeridge; Kendra Zuckerman, sr., OH, Tualatin; Kylee Wimmer, sr., RS, Lake Oswego; Maddie Hoover, sr., DS, Tigard; Sarah Talley, sr., DS, Oregon City; Sloan Culver, sr., OH, Lakeridge; Tallie Davison, sr., OH, St. Mary's; Tavia Roache, sr., OP, St. Mary's; Madison McKenna, sr., S, Oregon City; Avery Ensing, jr., S, Lakeridge; Bella Valdez, jr., L, Tualatin; Devyn Baer, jr., MB, St. Mary's; Bridget Barnett, so., S, Lake Oswego; Katie Dukart, so., L, Lake Oswego; Kylie Zralka, so., MB, Tualatin; Zoe Nguyen, so., S, St. Mary's.